If President-elect Donald Trump wanted to bring his thank you tour to only to areas of dense supporters, his Friday evening visit to Orlando might not have been an obvious choice. Trump will be speaking Friday evening at the Central Florida Fairgrounds, in a county he lost by 25 points to Hillary Clinton. And the fairgrounds and Orlando Amphitheater, where he’ll be at specifically, are in the heart of Orlando’s largely-African American west side, where Trump’s Nov. 8 election performance approached humiliating defeat. But still, it is the I-4 Corridor. It is what passes as the center of Florida. It is relatively easy to reach for anyone living in a state that arguably made the biggest flip in the country into Trump’s winning column. Orange County is a place with a 100,000 voter registration advantage for Democrats, an advantage that increases with every month’s new registrations. And yet Republicans still sit pretty in many ways. They have the county mayor’s office and control the county commission. And campaigning never really ends. Trump intends to seek ways to unite, Ross said. “Quite honestly we have a lot more work to do in Central Florida. We didn’t win Orange County. We didn’t win Osceola County. And we barely won Seminole County,” Ross continued. The amphitheater has lawn seating that makes its capacity flexible up to about 10,000. When Trump spoke there in early November, on a blisteringly hot day, there were an estimated 5,500 people. Ross said more tickets than that have been distributed for this event, but he has no idea how many will actually come. TRUMP TO SAY ‘THANKS’ – AND RAISE MONEY via Marc Caputo of POLITICO Florida – Before Trump gives his 7 p.m. address … Republicans will hold back-to-back fundraisers for his transition and the national party. … Trump is first scheduled to appear as a “special guest” at the $5,000-per-head Transition Finance Committee that’s being organized by his longtime lobbyist and top Florida Republican fundraiser Brian Ballard … Trump might also stick around for the $35,000-per-head RNC fundraiser that’s being held immediately after the transition team fundraiser. IS TRUMP PASSING ON JEFF MILLER AS VA SECRETARY? via Alex Leary of the Tampa Bay Times – Miller has not shown up at Trump Tower, at least to the knowledge of reporters, at the same time other names have come to the forefront. On Thursday, Pete Hegseth, founder of Concerned Veterans for America, was seen taking the elevator up to where Trump is filling out his administration. Trump is also said to be considering Navy Adm. Michelle Howard, as well as Gen. Ann Dunwoody. At the same time, Trump is under pressure to keep the current secretary, Robert McDonald, “out of concern that his rumored candidates’ inexperience and ideological leanings could cripple the massive veterans’ health care system,” The New York Times reports. Miller, who is retiring from Congress, was on most shortlists. ASSIGNMENT EDITORS: Congressman Ted Deutch and Congresswoman Debbie Wasserman Schultz will host a roundtable discussion with a variety of health care leaders on President-elect Trump and Republicans’ intent to repeal the Affordable Care Act. Discussion begins at 10 a.m. at the United Way of Broward County Jean and David Colker Center, 1300 S. Andrews Ave. in Fort Lauderdale. BEN CARSON’S WEST PALM BEACH HOME CAN BE YOURS FOR $1.2M via Jennifer Boehm of the South Florida Sun Sentinel – The 6,155-square-foot house was built in 1994 and features five bedrooms, four full baths and a half-bath and three car garage. But the highlights are in the details. “Mrs. Candy Carson did a masterful job herself” of decorating the home, said Arthur Martens of Engel & Völkers Florida, the listing agent. Coffered ceilings are adorned with hand-painted inlays and arched display niches. Columns, marble floors, custom built-ins and remote-controlled window treatments are found throughout the home. Floor-to-ceiling windows allow natural light in and the master suite has views of both the lake and the golf course. But the real centerpiece of the house? “For me, it is the grand entry,” said Martens. “It’s so palatial and beautiful with the golf course, water and pool in the foreground.” Sale of the home also includes an extra perk for avid golfers — a Premier Golf membership package which includes access to the three Nicklaus family-designed courses at Ibis Golf and Country Club. DAYS UNTIL: Shopping days until Christmas – 8; Inauguration Day – 34; Pitchers & catchers start reporting for Spring Training – 60; Start of 2017 Legislative Session – 91: Election Day 2017 – 325: Election Day 2018 – 692. IN TAMPA, BILL NELSON CALLS RUSSIA HACK ON DNC EMAIL SERVER “CLOSER TO AN ACT OF WAR” via Mitch Perry of Florida Politics – Speaking to reporters at his Tampa district office, the Florida Democrat made his most outspoken comments about the continuing to evolve story, which a new level of attention Friday, when The Washington Post reported that the CIA had concluded in a secret assessment that Russia intervened in the 2016 election to help Trump win the presidency, rather than just to undermine confidence in the U.S. electoral system. “Not only is this an outrage, this is unprecedented. This is crossing the line, closer and closer to an act of war,” Nelsonsaid, adding that hacking information to influence an election is damaging to the integrity of an election. “I think there’s going to be serious ramifications of this, regardless of where you hear that different people in the intelligence community have differing opinions,” he said. GWEN GRAHAM SPREADS HOLIDAY CHEER DURING FINAL WORKDAY via Michael Moline of Florida Politics – Graham spent her last workday as a congresswoman at a Christmas tree stand in Tallahassee, helping customers select trees to take home — and reflecting on her time in Washington and plans to run for governor. “Are you that Gwen?” one customer asked. She was, engaging in a campaign tactic that propelled her father, Bob Graham into the governor’s office in 1978 and later the U.S. Senate, and helped send his daughter to Washington. “It’s a real opportunity to know people on a different level than you might if they just came to talk to you in your office or met you in Costco or something,” Graham said. … As for her future, Graham said she fully intends to seek the governorship but that the timing will depend on the health of her husband, Steve Hurm. He’s due at Moffitt Cancer Center in Tampa Wednesday for evaluation of Stage IV prostate cancer. “Every part of me wants to run for governor,” Graham told reporters. “It’s what I know I need to do for the state of Florida. But things happen in life that might take me off that path. I hope not.” Hurm has been encouraging her to campaign. “I wouldn’t do it without him by my side,” she said. RICK SCOTT TO ANNOUNCE HIS HIGH COURT PICK via Mary Ellen Klas of the Miami Herald – Either Wendy Berger, C. Alan Lawson [or] Dan Gerber will be standing next to … Scott in his Capitol office at 8 a.m. … for a rare Tallahassee news conference to announce the governor’s first — and potentially only — pick to the Florida Supreme Court. The new judge will be replacing Justice James E.C. Perry who is retiring at the end of the month because he has reached the mandatory retirement age. The candidates all have two things in common: they are all self-professed conservatives, who abide by the “originalist” judicial philosophy that adheres to the notion that interpretation of law should be based on the original meeting of the text of the statute or the Constitution at the time its enacted, and they have each been heavily promoted by members of the Florida chapter of the Federalist Society, a conservative libertarian lawyers group many of whose members serve as the governors’ appointees to the Judicial Nominating Commission. The JNC interviewed 11 candidates to recommend the three names (who were widely expected to be the pre-determined list) to the governor. ASSIGNMENT EDITORS: Scott will announce November job numbers at HostDime, a global data center provider of cloud-based products in Orlando. Event begins 10:15 a.m. at 440 W. Kennedy Blvd., Suite 1, in Orlando. Entrance is located on the backside of the Office Furniture Outlet. For questions on driving directions, please contact Vikki Fraser at vikki.f@hostdime.com or (407) 222-5313. ENVIRONMENTALISTS GIVE MIXED ASSESSMENT OF SCOTT’S 2014 SPENDING PLEDGE via Bruce Ritchie of POLITICO Florida – During his campaign for re-election in 2014 with a land conservation spending measure sharing space on the ballot, Scott pledged to request $150 million per year in a second term for Florida Forever, the state’s land-buying program. As Scott begins to announce elements of his 2017-18 budget request, it’s not clear-cut whether he has owned up to his 2014 pledge for Florida Forever. The pledge was blurred by vague wording and parsed language that makes it difficult to determine whether he was promising money exclusively for land-buying. Environmentalists are mixed on the issue of whether Scott has met his promise or on what the promise was for. Eric Draper of Audubon Florida said Scott walked away from the pledge last year when the governor’s office said it requested $63 million for land acquisition. But Draper still praises the governor for his initiatives elsewhere on environmental spending. “I certainly hope he goes back to it (the 2014 pledge) this year,” said Draper, the group’s executive director. MOST FLORIDA KIDS FAIL TO GET HEAD START, REPORT FINDS via Leslie Postal of the Orlando Sentinel – The Sunshine State enrolls 16 percent of its 4-year-olds who live in poverty in Head Start and 12 percent of its eligible 3-year-olds, said the report by the National Institute for Early Education Research at Rutgers University. That means thousands of youngsters aren’t in the 50-year-old program designed to help them overcome the disadvantages of poverty before they start formal schooling. Florida’s Head Start centers, as a group, also don’t provide the high-quality classroom instruction the children need to be ready for kindergarten, the State of Head Start report says. Head Start, largely funded by Washington but with a requirement that local programs get some funding from other sources, spent more than $8 billion in the 2014-15 fiscal year and would need $14 billion more a year to serve all eligible preschoolers, the report said. PERSONNEL NOTE: MARIA SACHS TO LEAD INNOVATION FLORIDA via Jim Rosica of Florida Politics – Former state Sen. Sachs will be the next executive director of Innovation Florida, the new not-for-profit incubator for startup technology companies. “I am excited to be a part of a new initiative that will link venture capital and multinational corporations to research and development with our state universities, colleges and entrepreneurs,” Sachs said in a statement. “One of the keys to Florida’s success as the third most populous state is that every Florida graduate should have the key that will open a career in innovation.” Sachs “will use her lifetime background as a former prosecutor, attorney, legislator and community activist for the benefit of the organization, its partners and the future of Florida,” the release added. It also says that “through state appropriations, the Senator championed for expansion of research centers throughout the University systems especially at the South Florida based state universities and colleges.” Sachs, however, falls under the state’s 2-year ban on former lawmakers lobbying the Legislature or executive agencies. The 68-year-old, elected to the Senate in 2010, declined to run for re-election this year. LEGISLATORS FACE $750 MILLION GAP IN NEXT YEAR’S BUDGET via Arek Sarkissian of the Naples Daily News – The Legislature will need to come up with more than $750 million for next year’s state budget if lawmakers choose not to raise property taxes for schools and not to take cash from counties affected by the BP Deepwater Horizon oil spill, a Senate budget committee learned Thursday. Senate Appropriations Committee Chairman Jack Latvala said he would not take the $325 million the Legislature promised to the eight Gulf Coast counties affected by the 2010 oil spill. The counties are Wakulla, Franklin, Gulf, Bay, Walton, Okaloosa, Santa Rosa and Escambia. … Latvala was unwilling to promise a second year without a property tax increase needed for schools. This year, the Legislature froze property taxes used to pay for public schools, instead using $392 million from general revenue. “I think we’re going to have to let them take the additional property value,” he said. 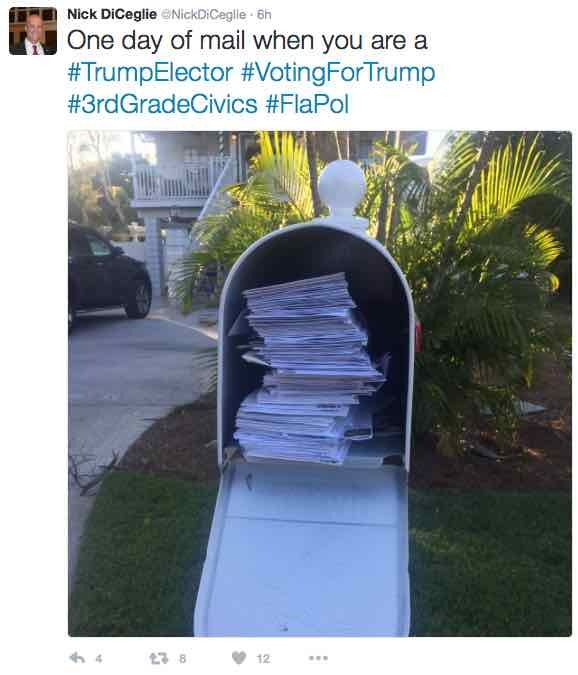 JANET CRUZ FILES FIX FOR VOTE-BY-MAIL SIGNATURE PROBLEM via Jim Rosica of Florida Politics – Cruz … filed legislation that would let voters fix mismatching signatures on their vote-by-mail ballots so they can be counted. The bill (HB 105) would require supervisors of elections and their staff “to allow submission of an affidavit to cure signature discrepancies.” The measure was in response to a federal case earlier this year. Cruz … said a “permanent statutory fix” was needed “to ensure that all Floridians have the ability to remedy a mismatched or illegible signature.” … “As the right to vote is a bedrock principle of our democratic society, it is vital that the people of Florida have every opportunity to ensure that their voice is being heard at the ballot box,” she said. BOOZE BILL WOULD BENEFIT CRAFT DISTILLERS via Jim Rosica of Florida Politics – The bill (SB 166), filed by Republican state Sen. Greg Steube … would change state law to craft distillers’ benefit. One proposal expands how much booze they can produce and still be considered “craft,” raising the limit from 75,000 gallons per year to 250,000 gallons. The bill reduces distilleries’ state license tax from $4,000 to $1,000, provided “it is distilling and bottling all of its products in containers approved for sale.” It repeals limits on how many bottles distillers can sell directly to consumers, though it maintains a limit on bottles being no bigger than 1.75 liters. The measure also lets them sell their liquor not only in an on-site gift shop but also at “one other approved sales room located in the same county as the distillery’s production building.” Most notably, the plain language of the legislation appears to allow distillers to bypass the three-tier system of separate alcoholic beverage manufacturers, distributors and retailers set in place after Prohibition. The bill would allow a distiller to “transfer … spirits … out of its federal bonded space or nonbonded space at its licensed premises or storage areas to its vendor’s licensed premises or approved sales room.” Distributors and liquor stores have opposed measure to loosen restrictions, saying it would cut into their business. ASSIGNMENT EDITORS: State Rep. Loranne Ausley will visit two schools to promote her “Ready to Run” contest to encourage kids to get out and run. At 8:55 a.m. Ausley will visit DeSoto Trail Elementary School, 5200 Tredington Park Dr. In Tallahassee. Then, at 10 a.m., she will be at the Kate Sullivan Elementary School, 927 Miccosukee Road, also in Tallahassee. INSURANCE GROUP JOINS CAMPAIGN FOR ASSIGNMENT-OF-BENEFITS REFORM via Florida Politics – The Property Casualty Insurers Association of America has thrown its weight behind the drive to control assignment-of-benefits fraud against insurance companies. The organization said in a written statement that it “will be encouraging public policymakers to explore ways to protect consumers better from contractor fraud and litigation abuses that frequently occur following major storms.” The statement marked the end of the most active hurricane season in four years, including hurricanes Hermine and Matthew. The latter storm, according to AIR Worldwide, the risk-management consultancy, caused nearly $6.8 billion in insured losses within the United States. “The increase in storm activity also puts a spotlight on the need to curb abuses from unscrupulous individuals and companies that capitalize on consumers during a time of need,” said Chris Hackett, senior director for personal lines policy at the insurance group. “In Florida, we have experienced a sharp increase in assignment of benefits claims and lawsuits, which drive up costs and put financial strain on Florida consumers,” Hackett said. “It is imperative that our state leaders consider these reforms that will help curb AOB abuse and alleviate pressure on Florida’s insurance system.” Assignment-of-benefits (AOB) agreements allow policyholders to sign away their rights under their insurance policies to third parties — often contractors — in exchange for quicker repairs. But they are ripe for abuse by parties who inflate repair bills or file costly lawsuits. IF AT FIRST THEY DON’T SUCCEED: ELECTION CHIEFS WILL RENEW PUSH TO SHIELD VOTERS’ PERSONAL DATA via Steve Bousquet of the Tampa Bay Times – Fresh off a smooth election cycle, Florida’s 67 county election supervisors will pursue changes to the election laws in the 2017 legislative session. They pitched their ideas for the first time at a meeting of the revamped Senate Ethics and Elections Committee, chaired by Sen. Kathleen Passidomo … The supervisors’ point man on legislative issues is David Stafford, the Escambia County supervisor of elections. He told senators that the state should follow the lead of 19 other states and join ERIC, the Electronic Registration Information Center, an information-sharing consortium that helps states track down people who are registered to vote in more than one state. (Being registered to vote in more than one state is not a crime, but voting in more than one state would be). The state has rejected joining ERIC in the past, but Stafford said joining forces with other states is the right course of action. He said ERIC has identified more than a million voters who have changed states in the past four years. Stafford also renewed a request that proved controversial in the 2016 session: Making voters’ personal information, such as home addresses and birth dates, exempt from disclosure under the public records laws. FORMER PROSECUTOR WILL CHALLENGE DAPHNE CAMPBELL FOR MIAMI-DADE SENATE DISTRICT via Kristen Clark of the Miami Herald – Democrat Jason Pizzo says he hopes he’ll be “pleasantly surprised” by the work of new state Sen. Campbell, who took office barely five weeks ago. But for now, Pizzo is so concerned by the election of the Miami Shores Democrat and former state representative that he’s already ramping up plans to run against her again in two years. Pizzo, a 40-year-old former Miami-Dade prosecutor who unsuccessfully ran against Campbell for an open state Senate seat this year, plans to file paperwork … in Tallahassee to launch his 2018 candidacy — giving him 20 months to take on Campbell, or any other challengers who might arise. “Unfortunately, the outcome in November was the election of a senator who doesn’t and will not and cannot represent our district the way it should be represented, the way it should represent everyone’s families — including mine,” Pizzo told the Herald/Times. Pizzo cited Campbell’s recent legislative record in the Florida House where he said she didn’t advocate for women’s rights for abortion, efforts to halt climate change or proposals to reduce gun violence in vulnerable communities, including Liberty City and parts of Overtown, both of which are in Senate District 38. “There are so many critical, absolutely critical issues pending right now that will affect everyone’s life — their life, their health, their education, the climate,” Pizzo said. APPOINTED: Sherri L. Collins to the Palm Beach County Court. Victoria del Pino to the 11th Judicial Circuit Court. BALLARD PARTNERS TEAMS UP WITH LEADING ILLINOIS INFLUENCE SHOP via Florida Politics – Ballard Partners announced a “strategic alliance” with the Chicago-based All-Circo political consulting firm. “It gives us a marketing opportunity in a very important part of the country,” firm president Brian Ballard said. “We try to find the ‘best of class’ wherever we go.” John J. Kelly Jr., All-Circo’s president and owner, has been an adviser to Illinois’ Secretary of State, Senate President, and the Cook County Board President, as well as several state senators and representatives. The firm represents nearly four dozen clients – Fortune 100 corporations, top sports franchises, local governments and nonprofit organizations – in the state capital of Springfield, as well as Chicago and Cook County. “Blue-chip companies such as ADM, Miller-Coors, CVS Caremark, Bank of America and The Blackstone Group retain All-Circo to address their public policy interests and provide professional guidance in the always-fluid climate of Illinois politics,” a press release says. HAPPY BIRTHDAY to Rep. Holly Raschein.